The first year of life is full of new beginnings, between crawling, pulling up to stand, and finally walking! Watching your child take their first steps can be both exciting and nerve-racking. The first steps may look different for each child. While watching your children explore the world on their feet, you may observe that their toes point inward or outward. Learn more about the causes and treatment of in-toeing or out-toeing below. In-toeing, commonly known as “pigeon toe”, is when the toes face into each other while walking or running. This is commonly seen in infants and young children. In-toeing may be caused through hereditary genes or the baby’s positioning in the womb. If a parent demonstrated in-toeing as an infant or child, it is likely they will pass down the gene to their children. An infant may also develop in-toeing due to small feet movement and positioning in the womb. In-toeing is typically not painful for children and does not lead to arthritis. There are three types of in-toeing: Tibial Torsion, Metatarsus Addactus, and Femoral Anteversion. When the shinbone (tibia bone) is tilting inward causing the feet to point in. It is the most common cause of in-toeing in infants and young children typically under the age of two years old. It is typically due to positioning in the womb, and is noticeable at an early age. Tibial torsion frequently straightens out once the child begins to walk, but may take up to 6-12 months to fully correct. Although tibial torsion does not typically require intervention, surgery may be recommended after the age of eight for more severe shin rotations. When the front half of the foot, or forefoot, is turned inward. Studies have shown that metatarsus adductus may spontaneously recover without intervention in the majority of cases. Manual stretches of the forefoot can improve metatarsus adductus and may be provided by the child’s pediatrician, nurse, or physical therapist. In the rare case that metatarsus adductus does not correct on its own, feet casts can stretch the soft tissues of the forefoot to straighten out the foot. When the upper end of the thighbone (femor), close to the hip, has an increased twist causing the feet to turn in. It is usually not detected before 4-6 years old. A common symptom of femoral anteversion is sitting in the “w- position”. Treatment may include physical therapy to teach the correct positioning of walking, and occasionally, braces to shift the bone. The thighbone (femur) is angled backwards relative to the hip joint, resulting in outward feet positioning. Femoral retroversion is less common than femoral anteversion. Out-toeing is when the child’s feet point outward as they are walking and running. 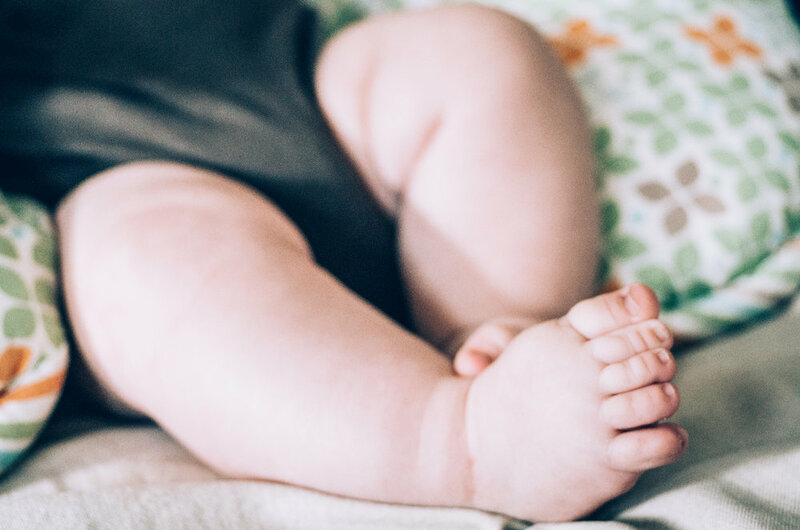 Out-toeing occurs less frequently than in-toeing and may be due to fetal positioning, abnormal growths, and/or underlying neurological problems. Unlike in-toeing, out-toeing may result in pain over time. There are three causes of out-toeing in children: Flatfeet, Hip Contracture, and Femoral Retroversion. A child is considered to have flat feet if they do not have an arch in their foot. If an arch does not form, the foot may appear to turn outward. Out-toeing due to flat feet does not require medical intervention and rarely causes pain. An infant’s hip may be externally rotated due to their positioning in the uterus. The external hip contracture may cause hip tightness as they begin to walk resulting in out-toeing. Hip contracture will spontaneously resolve on its own, so out-toeing does not require treatment if it’s due to hip contracture. In the majority of cases for in-toeing and out-toeing, braces, special shoes, and surgery are not required. Most children will spontaneously recover if their condition is not associated with an underlying neurological disorder. · Other developmental delays such as fine motor, gross motor, and/or language development. Physical therapy can help provide awareness of correct foot positioning when walking. Physical therapy may be recommended if the issue does not resolve on its own in a reasonable amount of time. If you feel like your child would benefit from a physical evaluation for in-toeing or out-toeing, contact Lumiere Children’s Therapy.